…you don’t have to test ad types, copy, headlines or images. Where all your competitors and market leaders hand you their campaign strategies on a velvet cushion. You’re there. All of these things can be achieved with a few shuffles of the same mousepad that brought you here. 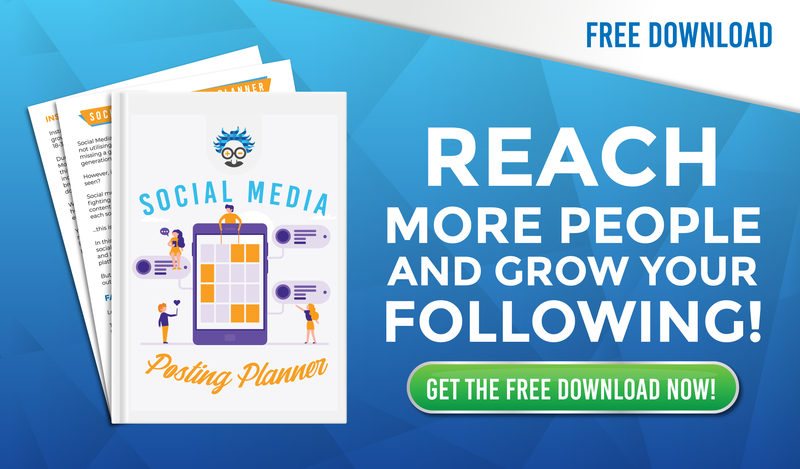 Either way, this article is going to explain what it is and give you a magic-bagful of tactics to send your Facebook campaigns into overdrive. But first, I want to show you how to find the open-door on both desktop and mobile. On desktop, you’ll want to visit any BUSINESS PAGE and scroll down the menu (on the left-hand-side) until you see a brand new button (at the very bottom), called INFO AND ADS. I’ve just bought some new Nike trainers for the gym, and because they’re fresh in my mind, we’re going to use them as an example…. You’ve found the secret door, but what happens next? 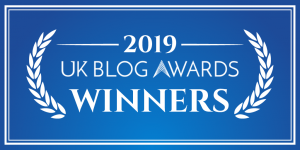 Our regular readers will remember an article I wrote a little while ago about SimilarWeb, and how it allows us to discover a competitor’s digital strategies, and then reverse engineer and hijack them. This Facebook update allows us to do the exact same thing, by discovering and analysing other market players’ strategies. 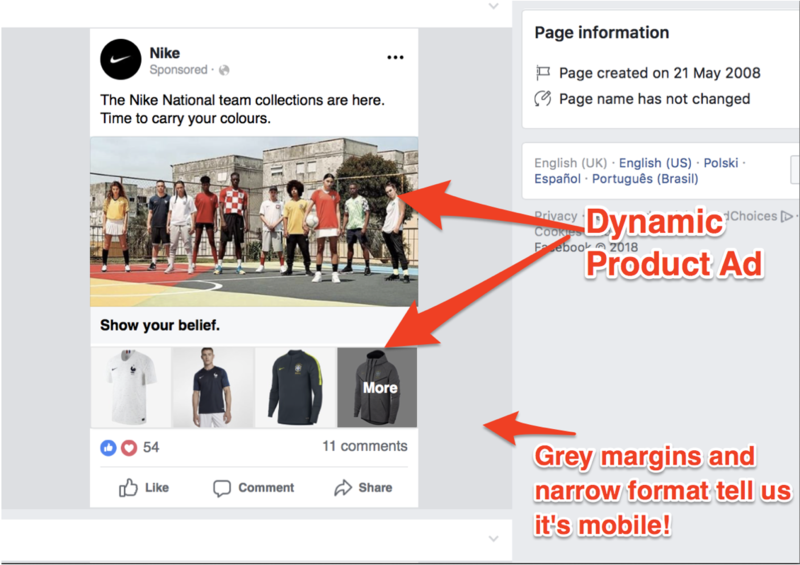 For the purpose of this blog, I’m going to use the NIKE page (hopefully it’s a brand you’ll all have heard of) and analyse how they’re running their ads in comparison to some others in their industry. 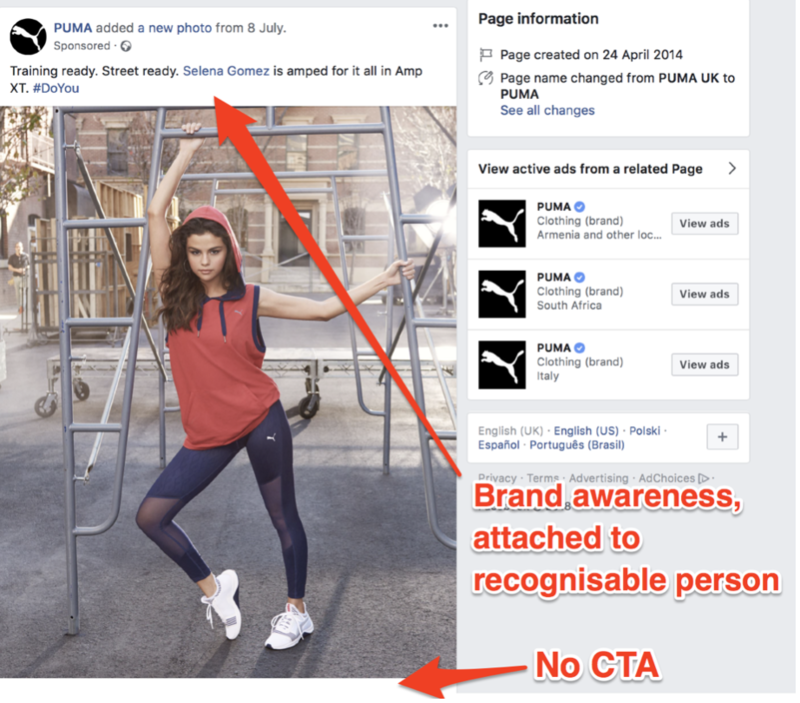 This demonstration should give you tactics to take-away and use in your own Facebook campaigns. …and unsurprisingly, (and annoyingly for the rest of us), they aren’t running a PAGE LIKE campaign. 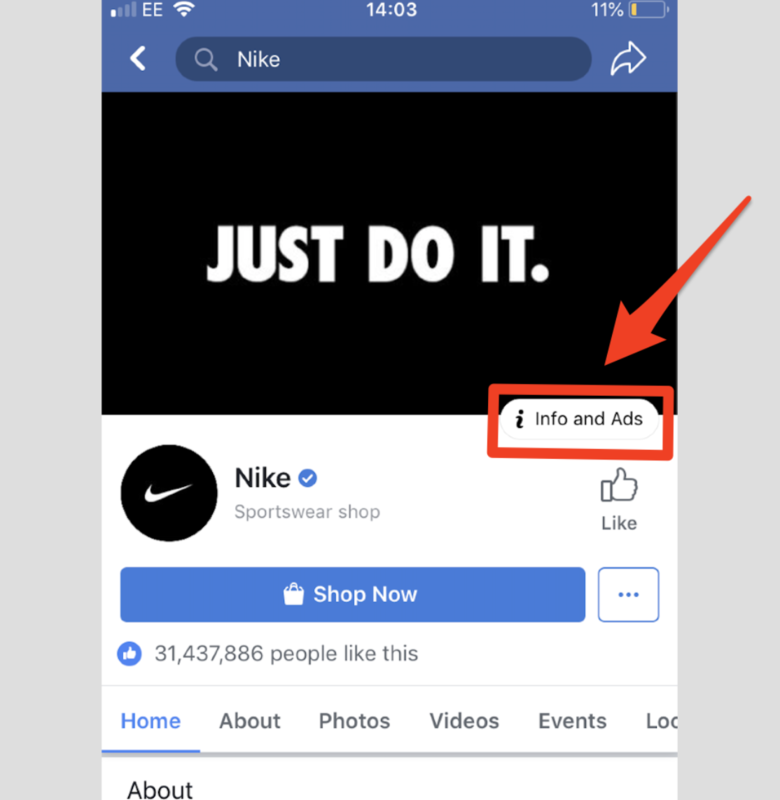 Their page-likes number COMBINED with their ad sets (I’ll show you them soon) demonstrate that Nike aren’t using their Facebook page to boost brand awareness or increase their reach. 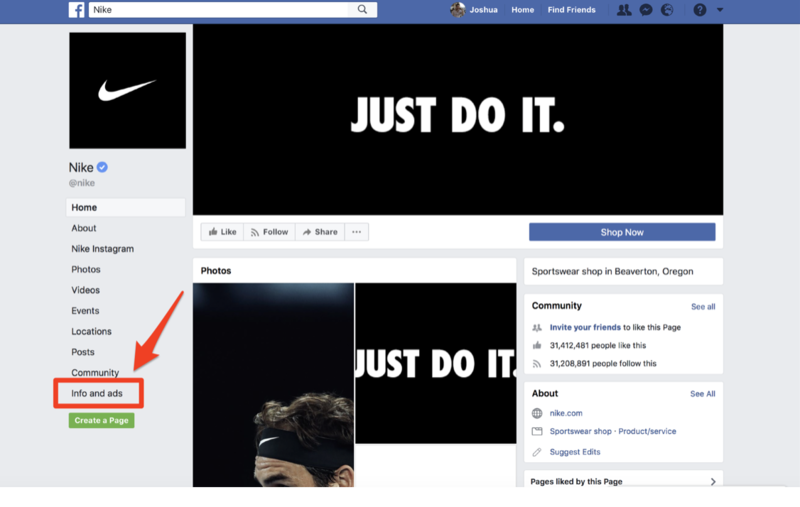 Every single one of Nike’s ads is product-centered, which tells us that their Facebook strategy is to SELL. They’ve built a massive reputation throughout their years in the industry and are quite happy to promote products on their social media profile. Nike is fortunate to be in this position. Smaller brands, especially start-ups MUST create a page-likes campaign to boost social-proof, brand awareness and reach. Nike’s biggest competitor, Adidas, have more page likes than Nike (34+ million), because they run an ad that drives traffic to their page. This tells me that they feel their brand isn’t quite as universal as Nike’s and they’d like to use Facebook to change this. 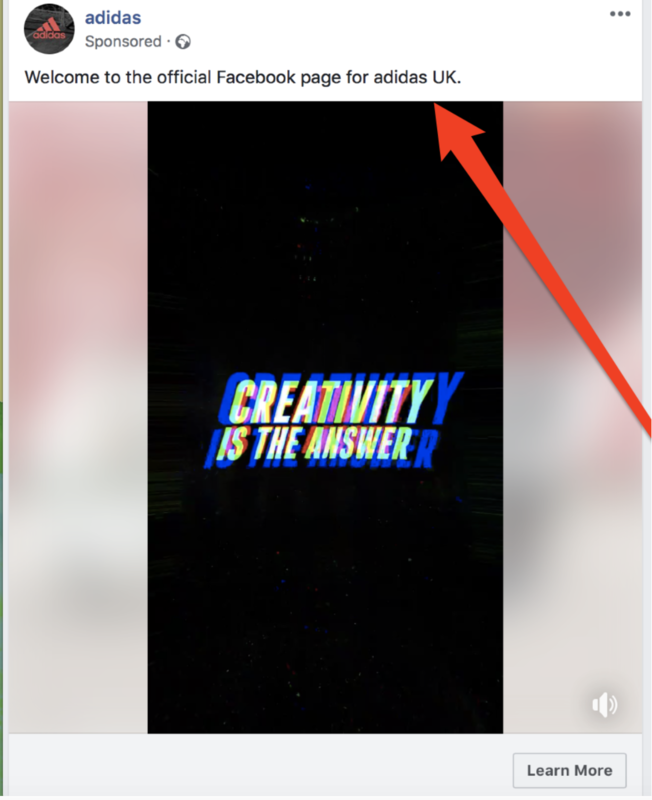 Adidas use VIDEO in their ad, this fast-growing content medium is something that you should all consider. It has high-consumption levels and is very SHARABLE, which increases reach. Using the ‘Info and Ads’ button we can analyse what ad types Nike are using and why. In total Nike are running 48 ads (at time of writing), 25 are Desktop Carousel Ads, 22 are mobile DPD ads, and 1 other (which we’ll come to later). If I was running campaigns to sell clothing, sportswear or targeting a similar market segment to Nike, I would use this information to focus EVENLY on mobile and desktop users. I’d target Carousel ads at Desktop users, and DPD ads at mobile users. We know these ads must work, because Nike has had much longer (than most of us) to test AD TYPES for this market, and they have huge marketing budgets. …but, in all 48 of Nike’s ads, they aren’t running any split-tests on copy, and their copy always uses the same format, 1 or 2 sentences, that rarely break into a second line. Nike obviously feels that there is enough need and knowledge around their products for them to sell themselves. We can see that they’re almost ‘daring’ their market by saying, ‘Not for the faint-hearted’, which is something that must appeal to their desired demographic. By analysing this copy, we can also see that their target market doesn’t like to be bogged down in text. Nike will have tested longer copy. 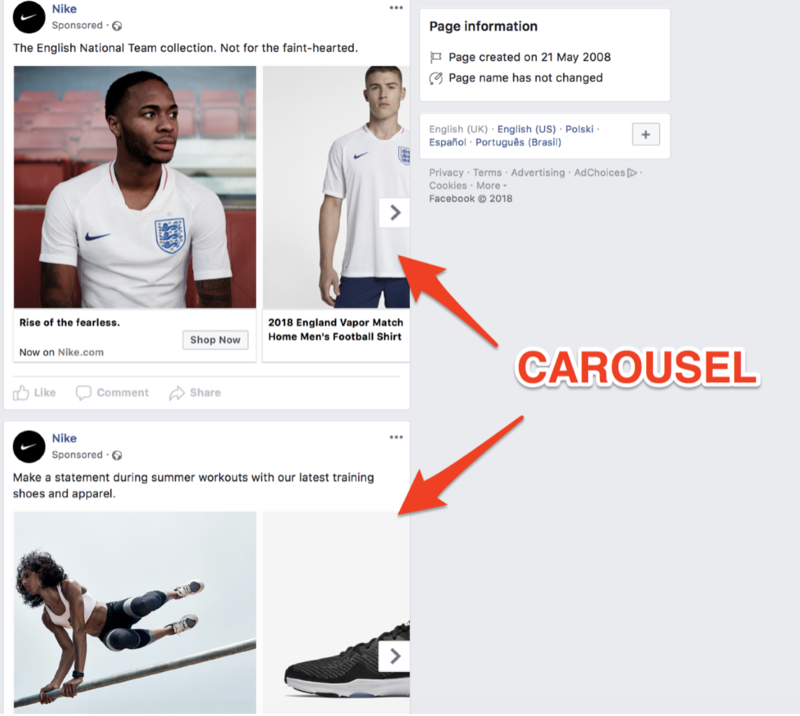 By pairing a CAROUSEL AD TYPE with super short copy, they are encouraging audiences to scroll through their products, giving them a greater chance of finding something they like. Another common feature of their copy is FREE DELIVERY and RETURNS. This is a recurring theme in many of their ad sets. We can trust that Nike have tested many different copy types and have recognised this as a WINNER. They will know that their target market care about free delivery and returns when it comes to online shopping and are using it as a selling point. Nike also use current trends and interests to attract engagement. At the time of writing this post, they are using the World Cup 2018 and Wimbledon to draw attention. Analyse ad copy for length, offers and promos (like free delivery) to understand what works in your industry. Nike might not test copy, but they certainly TEST CREATIVES (ad images/photos). The sportswear giants clearly have a tried and tested formula for their ad copy, but because their industry relies on a constant cycle of new seasons and new products, they cannot be sure what creatives will be most successful. So, they test! As with all tests, there are winners and losers. …this would give me a clear indication of what works. I could then apply this knowledge to my advertising campaign, saving my marketing budget from more tests! (Taking screenshots and revisiting ads will work for any type of test: copy, creative, ad type or headline). Many Facebook advertisers find themselves wondering which medium to target. As I mentioned earlier, Nike are targeting both, but this DOES NOT mean it’s the same for every industry. 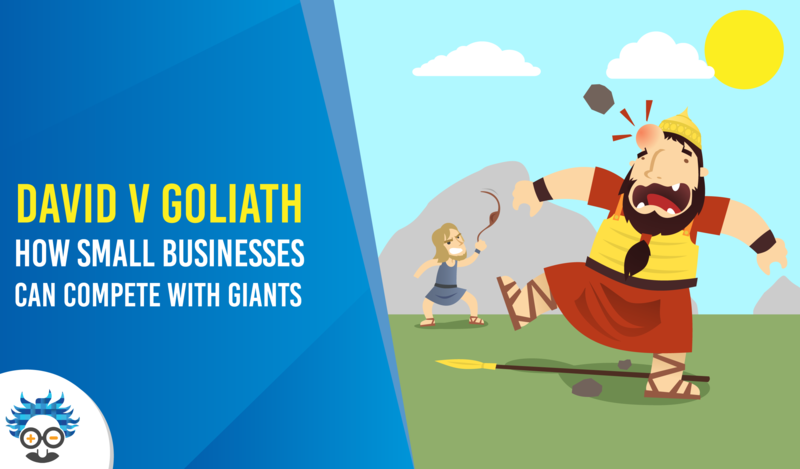 Analyse a cross-section of successful businesses who target a similar audience and use these results. If you’re still unsure, test yourself! I checked out some of Nike’s competition: Adidas, Under Armour and Puma, and discovered that they’re ALL only running ads on Desktop! …that means testing a Nike style mobile ad, against a desktop campaign, before analysing the results. Nike have not adopted video in any of their ads, which is surprising. If I had similar products, targeted similar people, and had a similar goal to Nike’s, I would copy a lot of their campaign strategies, and avoid video. But, that doesn’t mean you should. -What is the key take-away of the video? -What is the production quality like? -What is the purpose of the video? -Where does the ad take you? New Balance is a competitor (of Nike), who are using video to SELL. Their video ad offers us the framework for a potential video ad test. I can see that it is completely product-centered, very simple, short in length and the use of colour (on a grey background) tells me that the target market probably like a product that stands out. 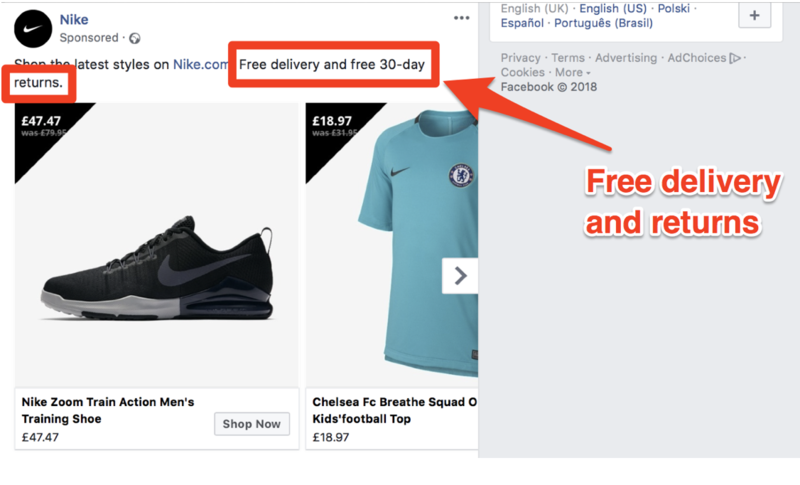 It’s impossible to discover what audiences Nike are targeting with their ads, but we can take a fair guess at what ads they are using for RETARGETING. Remember earlier, when I said there was 1 ad that wasn’t a Carousel or a Dynamic Product ad? This 1 in 48 is a simple Image Ad, used as a retargeting tool. We can speculate that this ad is targeted at people who visited the Nike website but did not convert (tracked by their Facebook pixel). Given that we are able to read all other ads and visit their links, it’s clear that this is a retargeting ad. The simple Image Ad has one clear goal: get visitors to return to the Nike website and buy. Nike use a discount code, which gives shoppers an extra 20% off, to entice them back into the buying process. With this knowledge under my belt, I would create a similar retargeting ad for cart abandons. I would use the word ‘’SALE” and the discount amount ‘EXTRA 20% OFF’ in the image and place the promo code in the copy. The sections above will build the fundamental elements of your ad campaigns, but there are a few ways to improve further. Do the predominant colours in your competitor’s ads follow their branding? Or do they use a variety? How does it appeal to their target market? Nike promotes a modern, fresh and cool feel to their ad sets with very minimalist white colouring. Although not relevant to our sports brands, illustration could make a huge difference to your campaign. If your competitors are using design elements in their images, perhaps it’s time you tested them too. Source a great designer with a service like DesignPickle. 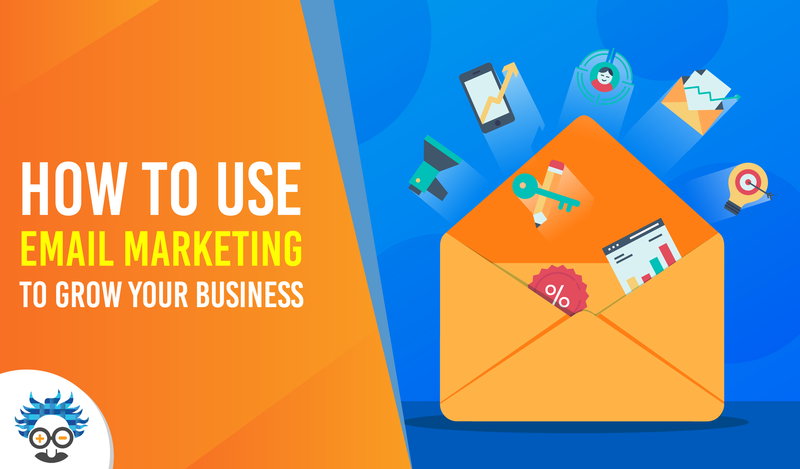 The text you choose in your CTA will depend on your campaign’s goals. Analyse, test and don’t be afraid to copy big players in your industry. Nike use ‘Shop Now’ in all of their ad CTA’s. These are easy to miss when analysing all the different elements of an ad. Emojis are becoming more commonly used, as they catch attention and emphasise key parts of our copy. Keep your eye out for emojis, and always make a note of which ones they are, just because a competitor has used a red arrow, that doesn’t mean a smiley face will work too. Before you go away and mine this enormous resource, there are a few more strategies I’d like to share from Nike’s competition (and I don’t want to put all my research to waste!). …but, they aren’t using Facebook ads to sell. Instead, they have adopted a Brand Awareness campaign with no CTA in the ad. Their ad is simply an image of a celebrity wearing their clothing, with a short piece of copy describing the product. This technique is designed to create social proof, attract fans of the celebrity and boost awareness without asking the viewer to take action. Wilson are running a collection of campaigns (split-testing images and videos) to grab leads. 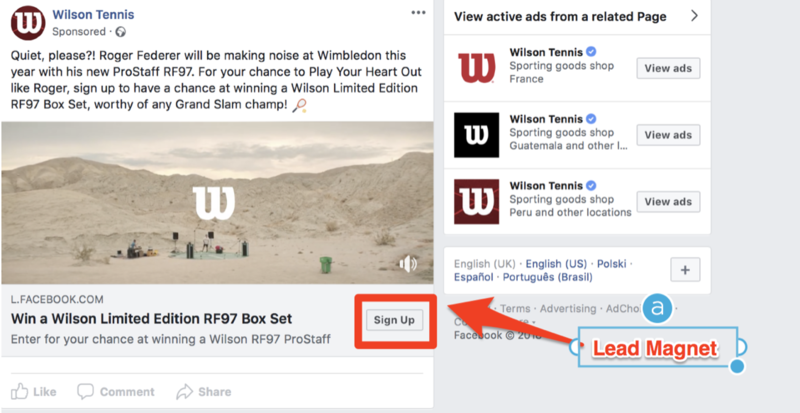 By attaching a well-known tennis player to a competition, they encourage users to exchange their contact information for a chance to win a box-set of their products. They ask for an email address, name, date of birth and gender in exchange for entry. This gives them the opportunity to TARGET, COLLECT DATA and remarket in the future. By understanding gender and age, they can create specific remarketing communications. The use of name means they can personalise every message. I wasn’t able to find any ads based on content interest by sports-wear brands. So, I went to a place I knew I’d find them, a supermarket chain. 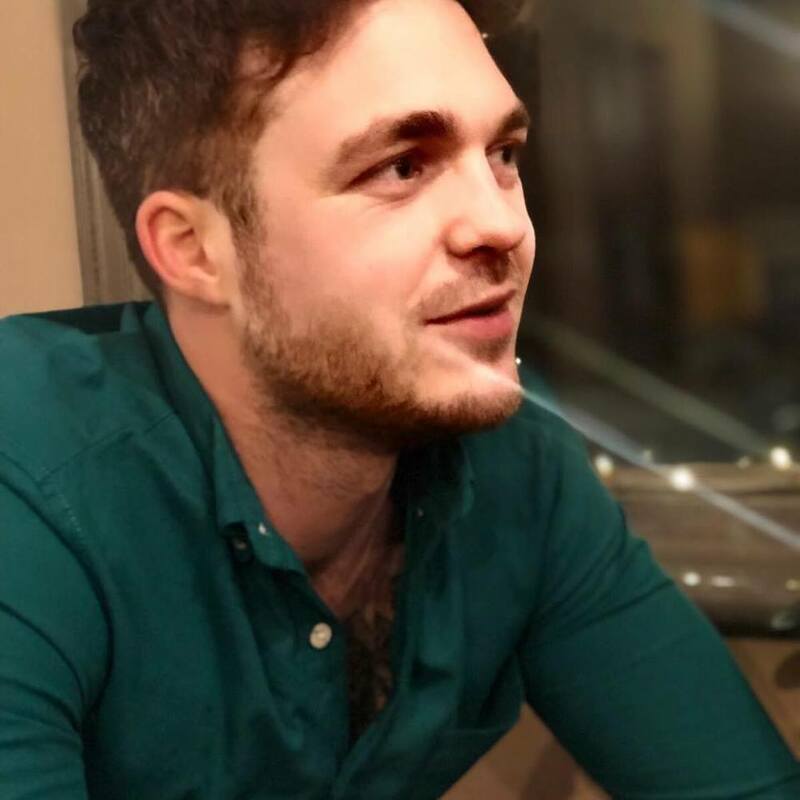 Tesco is the UK’s largest supermarket brand, and amongst other ads, they are running an awareness campaign based on content interest. This ad does not promote any specific products or the brand itself. Instead, it uses a recipe to appeal to their audience. 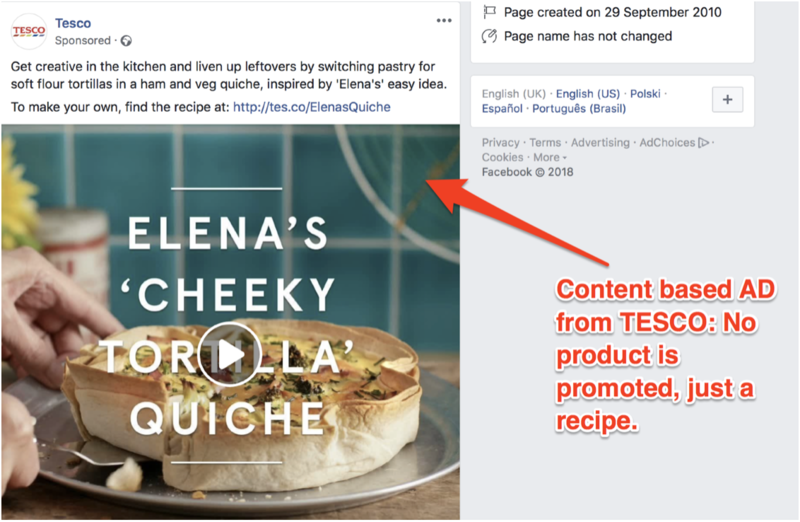 This technique allows Tesco to retarget viewers with other promotions (further down their funnel), and by giving their audience value, increases the likelihood of them consuming future ads. Unfortunately, it’s impossible to see the analytics of each campaign, but tools like SimilarWeb and Alexa allow us to make educated guesses. Use SimilarWeb’s ‘Traffic Sources’ and ‘Social’ tabs to determine how many visitors they are gaining from Facebook, and measure this against their ‘Traffic Overview’ score. For instance, Nike gained 60.54 Million visitors in June 2018. 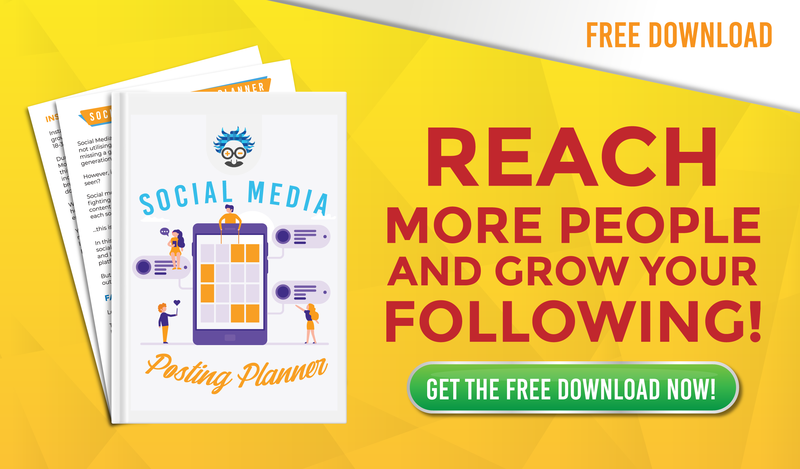 Of this 6.83% came from social, creating 4,134,882 visitors. 34.04% of these were from Facebook, meaning 1,407,513 visitors were directed to their buying platform from Facebook. 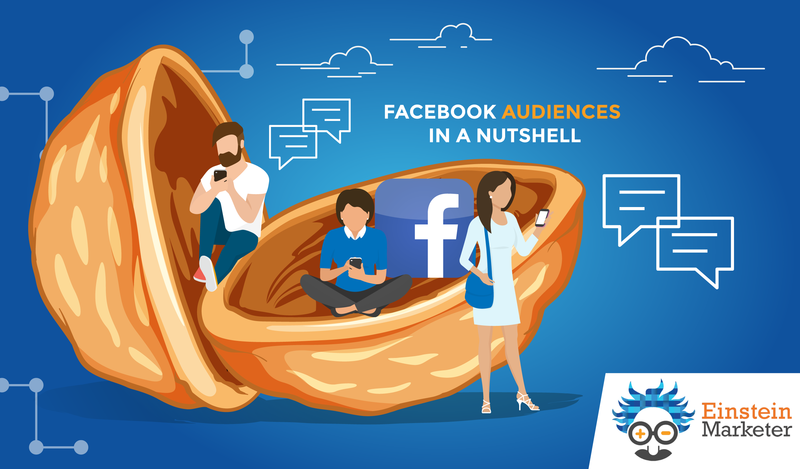 The low percentages from social might be due to their focus on SELLING (via Facebook), or because they gain huge numbers of visitors from direct traffic. Either way, 1.4 million visitors (in one month) sent to BUY from Facebook isn’t bad and is no doubt a very profitable source for Nike. The new Facebook Info and Ads button is a treasure trove of valuable information. I hate the word ‘hack’, but by discovering your competitors’ strategies, and analysing how they are targeting the same market as you, you will cut a number of potentially expensive corners. Reverse engineering is a great way to save money and discover marketing techniques that suit your target audience. If you are unsure, use your competitors’ strategies to test against your own. We can use tools like SimilarWeb to estimate, but you’ll never know for certain unless you run the campaigns yourself! 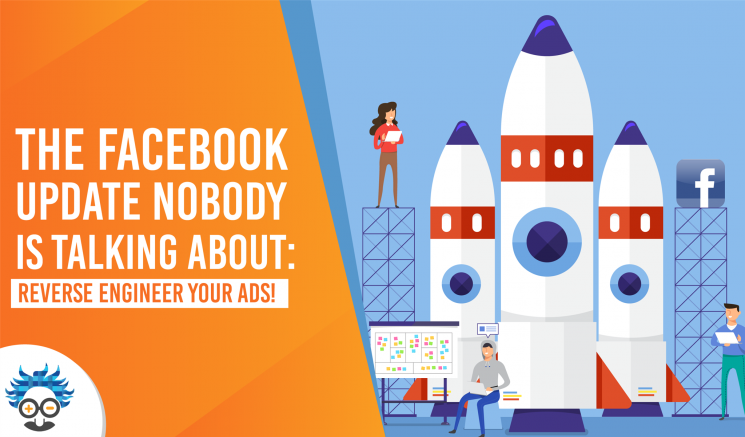 What do you think of reverse engineering your Facebook ads? Had you already heard about the new update, but hadn’t used it yet? Leave a comment! Your feedback is super-valuable! 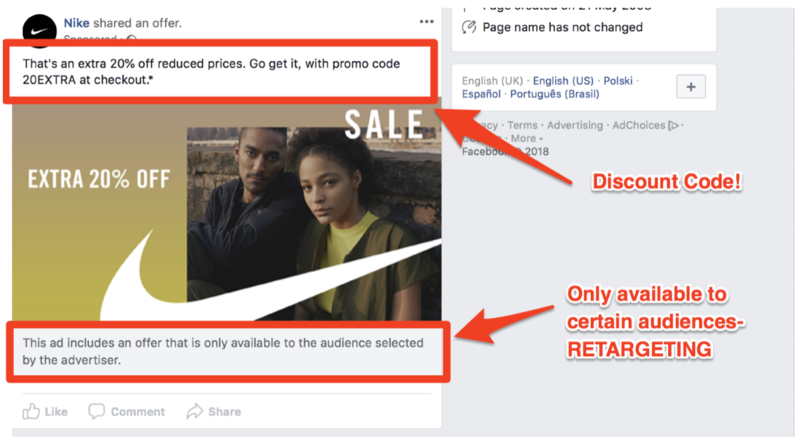 If you’d like to learn more about Facebook ads, check out our Ultimate Guide to Facebook Ad Campaign Objectives 2019/2019! Thanks, man this information is very helpful for me. I will surely implement these things when I will run my next facebook ad campaign. Pleased to be of assistance!